Community and residential care environments will often have to accommodate patients at pressure sore risk, but many pressure relief mattresses can carry prohibitively high costs. The Sidhil Softrest Contour Foam Pressure Relief Mattress is designed to provide an affordable surface that provides pressure relief, and is castellated to reduce shear and accommodate profiling beds. Made with castellated foam and supplied with a multi-stretch, waterproof cover, this mattress is suitable for those at medium pressure sore risk. 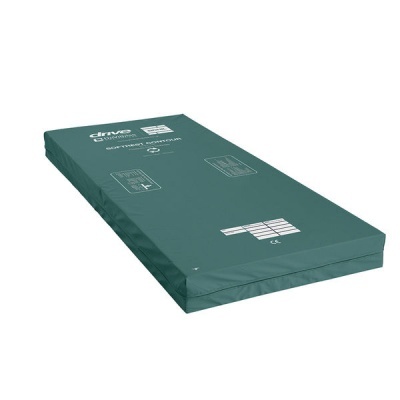 This Softrest Contour Foam Mattress is designed as a low-cost pressure relief option for facilities with limited budgets. Made with castellated foam, it will adequately distribute pressure along the surface of a patient's body to reduce the presence of dangerous high pressure zones. To protect the foam of the mattress and increase its longevity, it is supplied with a waterproof, vapour-permeable and multi-stretch cover that will help to reduce shear and friction forces. This Foam Pressure Relief Mattress is made with foam that is castellated on both sides. The castellations help the mattress to maintain its pressure relief qualities throughout the profiling process, and also help to reduce shear forces on the patient. Since castellations are present on both sides, the mattress can provide equal pressure relief and comfort regardless of which side it is turned on. Please be advised that the Sidhil Softrest Contour Foam Pressure Relief Mattress is usually delivered between 1 - 2 weeks of your order being placed. We would advise you to consider this delivery estimation before placing your order and apologise for any inconvenience that this may cause. For more information, please contact our Customer Care Team at 020 7501 0592.